Andhra: In its effort to attract global investments in medical device manufacturing faculties, Andhra Pradesh is showcasing an exclusive project in this sector at a major exhibition here. The 3-day Arab Health Exhibition 2016 at the Dubai International Convention & Exhibition Centre was yesterday inaugurated by Mohammed bin Rashid Al Maktoum the Prime Minister of the United Arab Emirates (UAE) and the Ruler of Dubai. “There is a congenial environment prevailing in Andhra including best industrial policy, 24×7 power supply and 10 lac acres of land dedicated to industrial purposes,” said Andhra Pradesh’s Health Commissioner KV Satyanarayana, who is leading the delegation. Gopinath MG, Director of AP Medical Infrastructure Corporation, said that Andhra being the biggest market for medical devices and having large number of medical colleges and super specialty hospitals is on its way to become the biggest medical hub in Asia. “To achieve this objective we have planned dedicated infrastructure for medical device manufacturing faculties,” he said. “The recent Central Government announcement of withdrawal of duty concession on import of medical devices and the concession duty on raw materials is very timely for success of our project. “This along with the National Medical Devices Policy on anvil will be complemented with our State led incentives to help make AP and India become a medical devices hub in the world,” Satyanrayana said. “We are pleased to be associated with the country’s first medical device park. 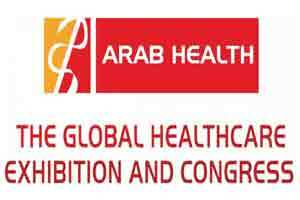 Arab Health Exhibition is a great platform to launch this project. It will assure global attention and interest and will go a long way in making this unique project a huge success,” said Rajiv Nath, Forum Coordinator, Association of Indian Medical Device Manufacturers (AIMED). Over 4000 pharma and medical device companies besides are taking part in the Dubai exhibition. Andhra government has earmarked 200 acres near Vishakhapatnam to build country’s first and among the world’s most advanced medical device manufacturing park. In a global first for any manufacturing park, this park will have a dedicated research, development and incubation centre to ensure that country becomes a global leader in chosen niche medical device verticals.